As we mark exactly 4 years since the last general election today, Supervisor of Elections Mohammed Saneem says they are now getting ready for the final push for voter awareness around the country from tomorrow and to ensure that voters get all the answers on elections before the Writ Of Elections is issued by President Jioji Konrote. Saneem says their aim is to reduce the invalid vote count from the 2014 general election which stood at 0.75%. He also says with a fully operational Fijian Elections Office over the last 4 years, they have achieved a lot to ensure that everyone is well informed about the electoral processes. Saneem also says he knows that he needs to deal with some political parties still creating mistrust, and this maybe due to lack of knowledge or a deliberate act to mislead people. 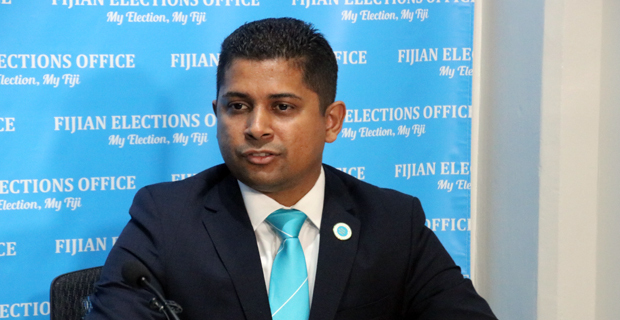 He stresses that all the parties need to be responsible as the Fijian Elections Office is doing all it can to educate everyone to have free and fair elections. Saneem says as part of the Voter Awareness Drive, they have plans to visit 269 locations in the Maritime Zone with the inclusion of the Lau Group, Lomaiviti, Yasawa, Rotuma, Taveuni and Cikobia. Meanwhile the Urban Registration Drive will be held in hot spots around the country. This will held in Voter Services Offices around the country and they also plan to open another 11 that will be placed strategically in places where there is high population and this will begin from this Saturday.